Newton's third law contends that for every action, there is an equal and opposite reaction. Using that principle as a guide, Metta World Peace met the side of James Harden's head on Sunday with a fairly vicious elbow, laying out the likely NBA Sixth Man of the Year and earning himself an ejection. In other words, a powerful force of action. Tuesday, the league office met that action with one of its own, announcing that MWP will be suspended for seven games. Gary Zielinski didn't buy what MWP was selling, and neither did the league. Does this truly constitute an "equal" reaction? Hard to say, as the science of comparing 'bows and penalties is similarly murky to that of apples and oranges. But the penalty was no joke, which was to be expected. Between the act itself, the way MWP squared off against Serge Ibaka afterward and his long list of previous transgressions (including last season's playoffs against Dallas), a wrist slap felt unlikely. And MWP didn't deserve to be let off easily. This was extremely dangerous, dirty and unwarranted, a sucker punch with an elbow. Harden could have been seriously hurt, and a strong reaction was necessary to create a future deterrent. Since Sunday's incident, I've heard Los Angeles Lakers fans on the blog, on Twitter and on radio say Harden got what he deserved because he "talks trash to Kobe Bryant" and "was making contact with Metta." Respectfully, either rationale is ridiculous. The "contact" initiated by the Oklahoma City Thunder guard was what I often refer to as "getting in place to receive an inbound pass." Were Harden looking to instigate or irritate, he'd have hit MWP with some actual force, rather than meander into him at a glacial speed. And second, yapping throughout a game isn't grounds for an elbow that could result in having your jaw wired shut. This isn't a street fight. You don't go clocking dudes because they got in your face or talked smack. Everyone in the NBA is a paid professional, and in the case of Metta, a rather handsomely paid one. There are boundaries, and everybody knows them. Admitting the painfully obvious -- Metta's actions were irrefutably wrong -- doesn't make you any less loyal to the Lakers or even to Metta himself. It just makes you sound like you possess a shred of objectivity. 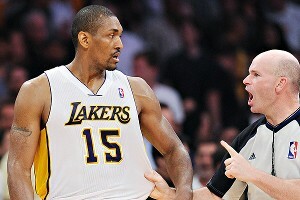 As for matters concerning basketball, Metta's ban puts the Lakers in a bind. Offensively, he has experienced an April rebirth, particularly during Bryant's absence. Whether as a scorer or facilitator, an outside shot and comfort zone has been discovered after nearly a season's worth of physical and mental struggles. The Lakers may be stockpiling scorers these days, but they can never have enough sources of scoring, especially with Ramon Sessions currently in a funk. Plus, World Peace has a knack for hitting big shots. That Kobe has consistently passed to Metta late in fourth quarters isn't only because the dude's always left open. That ability to come through in crunch time will be missed. Meanwhile, Metta's calling card has always been defense, and that's where he'll be especially missed. As of now, Lakers will most likely open against the Denver Nuggets or Dallas Mavericks, and MWP's services have proven handy against both teams. He was the leader of two efforts (Dec. 31, then April 13) limiting Danilo Gallinari to seven points and could be employed to check Nuggets big (Al Harrington), medium (Wilson Chandler, health presumed) or small (Andre Miller). In separate games against Dallas this season, Vince Carter and Delonte West were cooled after white-hot first halves, and MWP has enjoyed scattered possessions bothering Dirk Nowitzki. He's easily the Lakers' most versatile defender, a key asset when Mike Brown decides to go small or throw a curve ball at an opponent. Options carry the worth of gold to a coach, and Brown just lost 260 pounds' worth of that precious metal with World Peace now unavailable. The options for holding down the fort in World Peace's absence aren't exactly ideal, either. Matt Barnes is a reasonable starting option, but a promotion would weaken the bench and he may be limited by a bad ankle. Devin Ebanks turned in solid performances filling in while Kobe nursed a shin injury, and his defense on Sunday against Kevin Durant was often spectacular. However, he also has logged only 485 career minutes, not one during the postseason. He's completely unproven as an NBA player, and the playoffs can be a tough stage for making bones. In past seasons, Bryant would be the fall-back option at the 3, but that's currently more difficult. A Sessions-Steve Blake backcourt has already proved problematic because of the size Blake surrenders checking shooting guards. And again, Sessions is slumping at the wrong time. Moving forward, I also wonder if this incident could jeopardize MWP's future in L.A. The Lakers still have their amnesty provision available, and given how the bottom line has greatly influenced trades and roster decisions, it figures the front office will at least consider pulling that trigger to shed salary. The prime candidates are either Blake or MWP. From a pure basketball perspective, assuming Sessions is on the roster next season, Blake is the obvious choice. He's generally underwhelmed as a Laker and Darius Morris is waiting in the wings, making the veteran potentially expendable. MWP, bouts with inconsistency acknowledged, has vastly outplayed him to boot. However, MWP makes considerably more money. Finances might squeeze Metta under normal circumstances, but when you consider this is the second consecutive season Metta's temper has yielded a postseason cost, his contract could feel even pricier. Nobody gets into business with MWP expecting Swiss-watch reliability, but it's reasonable to expect the guy to avoid being a loose cannon, especially during important moments. Using the amnesty clause on MWP could very well have been Plan A anyway, but I wouldn't be shocked if this incident served as the proverbial "final straw." And finally, there's the element of disappointment. Not even disappointment in World Peace, but rather for him as the failure to control bad impulses threaten to undercut positive steps taken in his life. I've expressed on many occasions my admiration for the strides he has made as a person and mental health advocate. Fueled by desire to make a positive mark in the world, he has opened up about the professional help and therapy he has received, lending a public face to an issue often unfairly mired with stigma. MWP's efforts are important and have helped a lot of people, while in the process rehabilitating a once-radioactive image. This incident unfortunately represents steps backward, a mess that will inevitably overshadow for many his generally good intentions and genuinely good heart. It's a shame to see this image rehab hit a snag, but unfortunately that's the position World Peace has placed himself in. And in the process, the Lakers will feel that pinch.